Invisalign® is virtually invisible, removable aligners that are custom-fit for you. These aligners adjust your teeth over time, focusing on guiding different teeth with each phase of adjustment. Based on your needs, your doctor develops the custom treatment plan created specifically for your smile. You can read more about the Invisalign® treatment process here. But how do you know if Invisalign® is really right for you in comparison to traditional braces? Invisalign® is less noticeable than traditional braces (that goes without saying, right? ), so if your job requires you to be in front of people a lot, then Invisalign® has definite advantages. Taking care of your teeth throughout the treatment is easier with Invisalign®, since you can still brush and floss normally. Keeping oral hygiene as simple as possible is good, right? On the financial front, there’s good news too. A couple years ago, Invisalign® was nearly always more expensive than traditional braces, but now, the prices are much more compatible. With Invisalign®, you have to brush your teeth after every meal. Yes, you’re supposed to do that with traditional braces too, but when you have to put those trays back in, you really, really have to brush your teeth. Some people like to brush their teeth after every meal anyways. If that’s you, then, hey, you can check that checkbox. 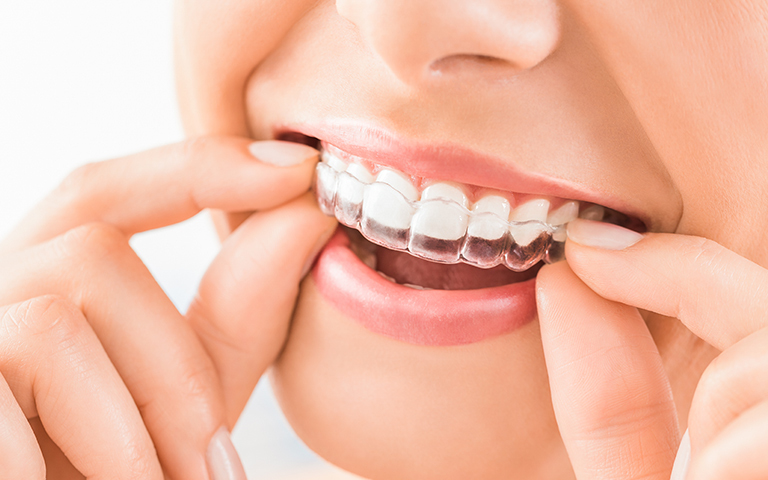 Invisalign® trays need to be worn 22 hours a day. And if you want best results, you really need to be pretty strict about following through on that. If you’re not the kind of person that’s going to stay on track with that, then Invisalign® might not be your best investment. If you’re comparing discomfort levels, the reality is that a certain level of achiness and sensitivity is inevitable with both Invisalign® and traditional braces adjustments. We wish we could say otherwise, but there’s no escaping the fact that moving teeth is uncomfortable at times. Each patient’s experience is different, so hope for the best and keep your favorite soft comfort foods on hand! We hope that this information is helpful for you! At the end of the day, what kind of braces you get is your decision. It’s important for you to be happy with the product you choose, but if you need braces and are considering Invisalign®, it’s definitely a worth the conversation! Give us a call or come into the office to talk with us!